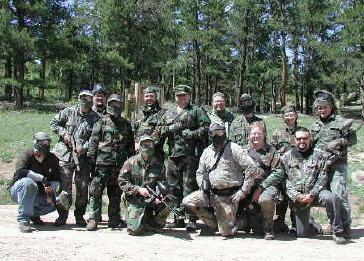 SWO Paintball is just a group of guys who regularly play some woodsball / recball style paintball together in the hills, parks and mountains. Saying that we're a group of guys is about as organized as we get as we don't participate in tournaments or anything like that. We just like to play and we don't care to keep score. We are based out of Fort Collins, Colorado, and generally play near there. When we do get together to play, it's always BYO-everything. We don't charge anything to play with us, especially since we're mostly on public land and we don't have a stockpile of equipment to outfit other people. We get much of our gear, paint and air from the local JAX where almost all of our woodsball needs are met.